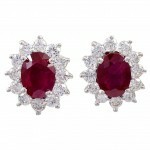 Beautiful natural faceted oval ruby and round brilliant diamond earrings in 18k white gold. The oval rubies are a combined total weight of 2.08cts, with 0.95cts in diamonds. The diamond quality is G-H color, VS clarity.